After attending the Heroes Welcome Home educational program earlier this year I was inspired to share the tips and resources for helping U.S. military veterans and service members with readers of Illinois REALTOR® Magazine. Below are a few of the resources mentioned in the story. There are specific housing programs for military veterans and special considerations for dealing with someone who may have a disability. Heroes Welcome Home covered these and more as part of a pilot project of the Chicago Association of REALTORS® supported by the National Association of REALTORS®, Illinois Associations of REALTORS®, and local boards including Mainstreet, North Shore-Barrington and NorthWest Chicagoland. 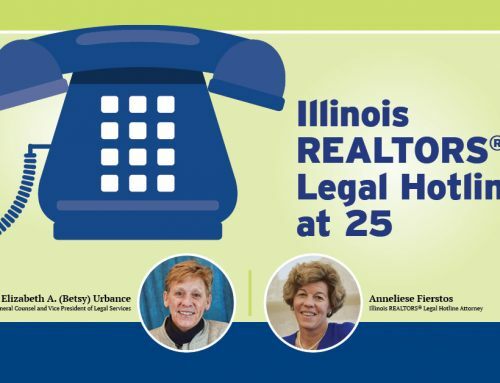 I am especially proud of the Illinois REALTOR® Heroes page where we show photos of some members of the Illinois Association of REALTORS® who have served our country so well. If you are an IAR member and have served in the armed forces please let us know at iarnews@iar.org. We want to honor all of you who take defending property rights to a new level! Thank you for all you have done for us! It’s great to see our REALTORS playing a pro-active role as Community Leaders via local Association initiatives. Here is another benefit some of you all might not be aware of for certain veterans. I also attended the Heroes Welcome Home program. I am very involved in volunteering for the vets, as well as I am a legion officer for many years. I am currently working in a focus group, at my Board, to assist with Vets needs. Thank you for the links, Sharon, as this is great info. We need to keep this info in front of us, so that we are always prepared and ready to help, and serve those that have served for us.